^ Popek, Gerald; Goldberg, Robert (1974). "Formal requirements for virtualizable third generation architectures" (PDF). Communications of the ACM. 17 (7): 412-421. doi:10.1145/361011.361073. ^ Smith, James; Nair, Ravi (2005). "The Architecture of Virtual Machines". Computer. 38 (5): 32-38. doi:10.1109/MC.2005.173. ^ Oliphant, Patrick. "Virtual Machines". VirtualComputing. Archived from the original on 2016-07-29. Retrieved 2015. 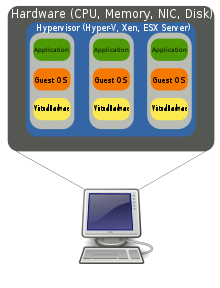 Some people use that capability to set up a separate virtual machine running Windows on a Mac, giving them access to the full range of applications available for both platforms. ^ "Super Fast Server Reboots - Another reason Virtualization rocks". vmwarez.com. May 9, 2006. Archived from the original on 2006-06-14. Retrieved . ^ "Server Consolidation and Containment With Virtual Infrastructure" (PDF). VMware. 2007. Archived (PDF) from the original on 2013-12-28. Retrieved . ^ Wirth, N.; Weber, H. (1966). EULER: a generalization of ALGOL, and its formal definition: Part II, Communications of the Association for Computing Machinery, Vol.9, No.2, pp.89-99. New York: ACM. ^ Nelson, Graham. "About Interpreters". Inform website. Archived from the original on 2009-12-03. Retrieved . ^ Aycock, John (2003). "A brief history of just-in-time". ACM Comput. Surv. 35 (2): 97-113. doi:10.1145/857076.857077. ^ Ingalls, Dan; Kaehler, Ted; Maloney, John; Wallace, Scott; Kay, Alan (1997). "Back to the future: the story of Squeak, a practical Smalltalk written in itself". OOPSLA '97: Proceedings of the 12th ACM SIGPLAN conference on Object-oriented programming, systems, languages, and applications. New York, NY, USA: ACM Press. pp. 318-326. doi:10.1145/263698.263754. ISBN 0-89791-908-4. ^ Bracha, Gilad; Griswold, David (1993). "Strongtalk: Typechecking Smalltalk in a Production Environment". Proceedings of the Eighth Annual Conference on Object-oriented Programming Systems, Languages, and Applications. OOPSLA '93. New York, NY, USA: ACM. pp. 215-230. doi:10.1145/165854.165893. ISBN 978-0-89791-587-8. ^ Ungar, David; Smith, Randall B (December 1987). "Self: The power of simplicity". ACM SIGPLAN Notices. 22 (12): 227-242. doi:10.1145/38807.38828. ISSN 0362-1340. ^ Hölzle, Urs; Ungar, David (1994). "Optimizing dynamically-dispatched calls with run-time type feedback". PLDI. Orlando, Florida, United States: ACM. pp. 326-336. doi:10.1145/178243.178478. ISBN 0-89791-662-X. ^ Paleczny, Michael; Vick, Christopher; Click, Cliff (2001). "The Java HotSpot server compiler". Proceedings of the Java Virtual Machine Research and Technology Symposium on Java Virtual Machine Research and Technology Symposium - Volume 1. Monterey, California: USENIX Association. ^ Uhlig, Rich; et al. (May 2005). "Intel virtualization technology". Computer. 38 (5): 48-56. doi:10.1109/MC.2005.163. ^ Keith Adams; Ole Agesen. A Comparison of Software and Hardware Techniques for x86 Virtualization (PDF). ASPLOS'06 21-25 October 2006. San Jose, California, USA. Archived (PDF) from the original on 20 August 2010. Surprisingly, we find that the first-generation hardware support rarely offers performance advantages over existing software techniques. We ascribe this situation to high VMM/guest transition costs and a rigid programming model that leaves little room for software flexibility in managing either the frequency or cost of these transitions.